“Buck” means voltage step down. The buck converter is a step-down converter that performs rectifying by means of a diode; it is a representative system used in non-isolated step-down switching DC/DC converters. In the world of DC/DC converters, the buck converter is often referred to as a diode-rectifying or asynchronous converter. Compared with the forward system discussed previously, because no transformer is used in a buck converter, the primary and secondary sides are not isolated from each other. In applications where isolated is not needed, this system, which does not use a transformer, provides a simple solution. 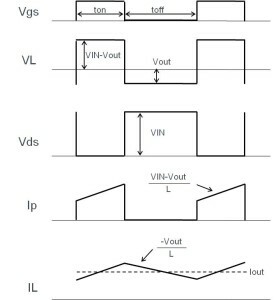 In the buck system, not requiring voltage regulation by a transformer, the output voltage is determined solely by controls performed by a MOSFET. For this reason, feedback from the output is always required (omitted in the figure). A characteristic of the buck system is first of all a simple configuration. For creating small-power power supplies, the buck system is more advantageous than the flyback system in cost, which accounts for the increased use of buck systems in power supplies for home appliance microcomputer devices. Because power is transmitted not through a transformer, however, the buck system produces more current flowing into a switching element than the flyback system for the same output power. Consequently, the buck system is used mainly in low-power applications rather than in large-output power situations. The buck system operates virtually in the same way as the forward system. The system features a circuit in which the transformer is removed from the forward system and the D1 is replaced by a MOSFET. When the MOSFET turns on, a current flows to the load through an inductor, and energy is accumulated in the inductor as well. During this operation, the diode remains off. When the MOSFET turns off, the energy stored in the inductor is supplied to the load through diode D2. 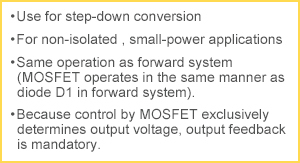 The MOSFET turns on and off, as in the case of diode D1 in a forward converter. When used in the switching system for AC/DC conversions, the buck system is limited to applications requiring a non-isolated power supply. Relative to the transformer system, the buck system offers the easiest-to-use switching DC/DC converter. Although more costly than the linear regulator due to an increased number of parts required, the buck system permits enhanced efficiency while keeping the advantages of the transformer method intact. In terms of efficiency with respect to the AC input, however, the buck system compares less favorably than the switching system-based AC/DC conversion configuration. ・Except for the lack of a transformer, the buck system parallels the forward type and it represents the basic form of a non-isolated DC/DC converter.